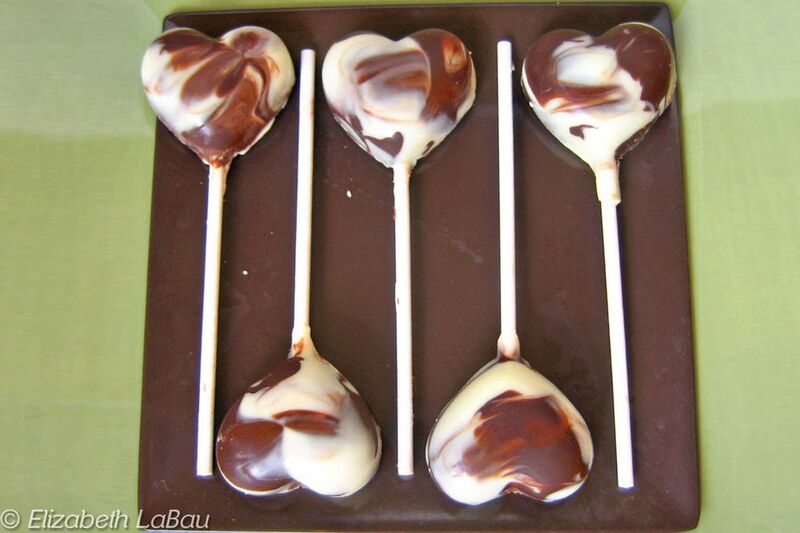 Marbled chocolate heart pops feature beautiful swirls of white and dark chocolate, molded into heart-shaped lollipops. These candies are perfect for Valentine’s Day, or any special occasion. Make sure your heart lollipop mold is clean and dry. Place the white and semi-sweet chocolate chips in separate microwave-safe bowls. Microwave the chocolates individually until melted, stirring after every 30 seconds to prevent overheating. White chocolate is especially sensitive to burning, so take extra care to stir the white chocolate numerous times during the melting process. If desired, add a few drops of oil-based chocolate flavorings to the white and semi-sweet chocolates and stir to combine. Once both chocolates are melted and smooth, take a small spoon and dip it into the white chocolate. Place a small dab of white chocolate in the bottom of each heart cavity, varying the placement of the white chocolate in each lollipop. Repeat the process with spoonfuls of semi-sweet chocolate. Continue to add the chocolates to the mold, randomly placing spoonfuls of white and dark chocolates next to each other to ensure variety in each bite. Once the cavities are almost full, take a toothpick and run it through the chocolate to get a swirled effect. This is best accomplished with a toothpick with a fat, rounded tip, as the fine-tipped toothpicks have a hard time swirling the chocolate on the bottom of the mold. Insert the lollipop sticks into the molds and cover the top of the sticks with chocolate. Use a knife or offset spatula to scrape the chocolate on the back of the mold into a flat layer. Refrigerate the mold to set the chocolate, at least 30 minutes. Once the chocolates are set, pop them out of the mold and serve immediately. In warm environments, the chocolate pops might start melting at high temperatures. To slow this process, you can use real chocolate (instead of chips) and temper the chocolate before use. This will make your heart pops less prone to melting, although they will still melt at high temperatures. This recipe will yield five (1 1/2-inch) heart pops. Depending on the size of the mold you use, you may need more or less chocolate. To store your chocolate heart pops, wrap them individually in cling wrap, and store them in an airtight container in the refrigerator for up to two weeks.